I love my new Abbey Road design. It has been a wonderful new addition to our collection and we've had a lot of success with it. 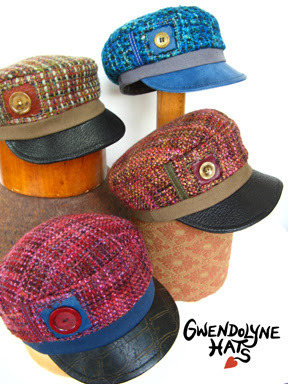 For years my customers have been asking for a Gwendolyne peaked cap. Well here it is! These beauties take over 150 steps to build and they're worth it. 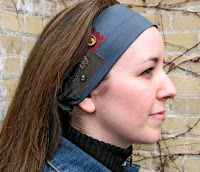 This cut is so charming, people are just loving the luxurious lamb leather peak and the vintage button accent. This edition is limited so I encourage those who are interested to come and visit the shop, there's still great choice in your size. This has been My Year of the Button! I love detail and will always embellish my designs with handwork. I've used antique and vintage buttons, but this year I became a serious collector. You'll see evidence of this in my latest designs. I find older buttons extremely beautiful, they have far more character than those produced today. Like my work they are practical things that overflow with spirit. I've added a bit more punch to our Clarissa cloche this year. The button accent is larger and plays a more dynamic role in its' detailing. The Celluloid buttons I've used, date from the 1890s to the 1930s. 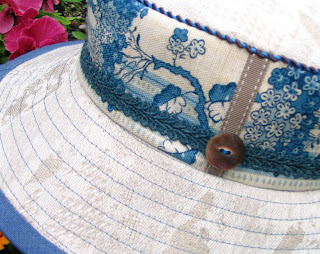 I have carefully selected the most beautiful button color and design to accent each hat. This way I can share my button passion with the world and get them back onto the street. It's great to see the big button trend on the new coat styles this year. Think about a hat to match. Oh what fun! 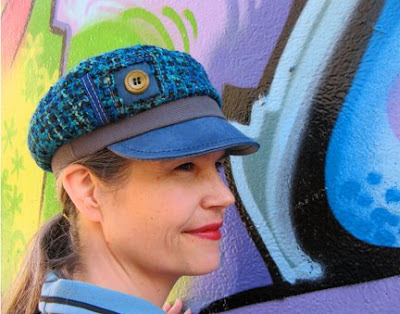 There are 3 stylish beret designs in our collection this year. 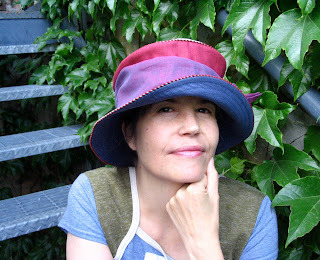 Remember you don't need to be French to enjoy a beret. These days there are many people who enjoy the romance, comfort and style of this timeless design. Here is picture of our Celeste on a happy new client. This is a very limited edition and each one is exquisite. There are great styling opportunities with this design because of it's fullness. 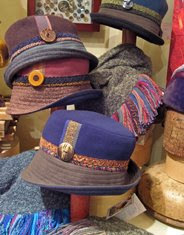 Its' collage of different woven wools and button detailing has a striking old world sensibility. 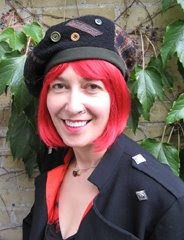 As for our other 2 beret designs, the Ashley can be seen on our website and the Wool Beret is in our store. Drop by and you can try on all three. I'm sad to say that this is the last year for our Tibetan design. This cozy Gwendolyne classic will look different next year. Unfortunately I'm unable to source all my materials. Change is a constant and with that comes new beginnings. Over the last 10 years there's been a drastic change in global manufacturing. I used to order my custom trims from a 70 year old Canadian company that closed two years ago when it couldn't survive this shift. We will see more dramatic changes like this in the near future as our industries struggle to survive in this new economy. As you can see the shelf in our shop is still full of this wonderful design. But this is the last batch. 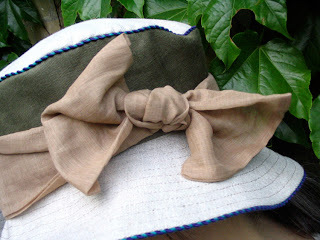 So, if you’ve enjoyed your hat and thought of replacing it, or if you’ve always dreamed of owning one... This is the year! There is still time to visit our shop before we pack our work and go to The One of a Kind Show (at the Direct Energy Centre, Exhibition Place, Toronto). Our shop will be closed from Wednesday Nov 15th until Dec 5th for this exciting shopping event. If you can't make it to the show or prefer a more leisurely shopping experience be sure to drop by our shop before then. Come experience our fabulous new collection in the beautiful atelier where we design and create it. Enjoy the pleasure of trying everything on in your own size and colours. Take your time and discover what looks best on you. Let our expertise and well-trained eyes be your guide. We love to give our clients the best in personal service. 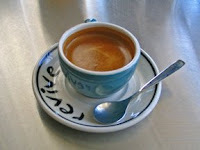 Perhaps an espresso coffee will be what you need when you drop by. Please ask us if you crave one, we love making them for our customers. Time is just flying by as we busily prepare for the One of a Kind Show. Our hectic and full schedule can be a bit daunting at times, but when I sit down and dream of my customers’ enthusiastic response to my beautiful new designs, it's all seems worthwhile. 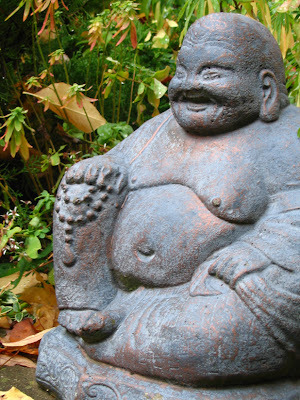 I ask that you give us a blessing of good luck by rubbing this Buddha’s belly button. He always brings a smile to my face. It has been a while since my last post. 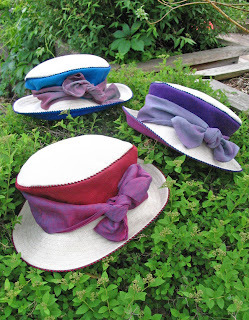 Our Summer seemed to pass by so quickly as we created beautiful hats in the studio and played in the city. 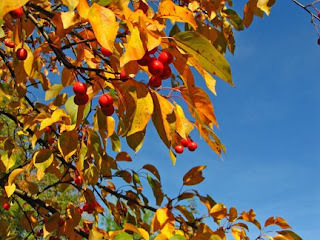 Autumn has arrived and winter is just around the corner. Time to cozy up for the cool weather ahead. I always look forward to the Fall. The drop in temperature and smell of the earth are my first signs. The crisp light and brisk air stimulate my senses. I begin my preparations at home by opening my trunks and pulling out the warmer clothing. It's always exciting to see my clothes again but, what do I need to complete my wardrobe? Our food choices begin to reflect the juicy full flavors of the harvest and the cooler temperatures make it all taste so good. William and I love this season. Perhaps it's the Cavalcade of color that spurs us on. 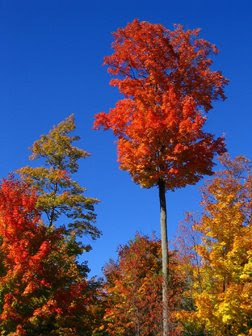 Mother Natures' fiery display of burning brights and her rich but subtle earth tones inspire my colour sensibilities. Our Atelier is bustling with activity at this time of year. The Shop is full of abundance. New hats are coming out of the workshop daily. Customers are dropping by to see what’s in store for them. 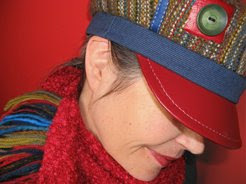 It’s a busy and exciting time of year for Gwendolyne Hats. We work all year round to prepare for this moment. This is when our work truly shines and we look forward to sharing it’s radiance. Our designs come to life on people and they're always a lot of fun to try on. So we invited a couple of friends over to play Dress Up. We took pictures and created two slide shows to illustrate some of our new collection for you. Above is a picture of Joey in the Aubrey. 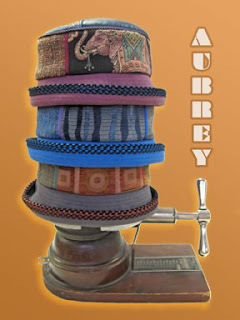 The Aubrey is a beautiful patchwork poem of tapestries from around the world. This mid-season design, with a three panel lamb leather top, offers great protection from Fall to Spring. See more hats on Joey click here. 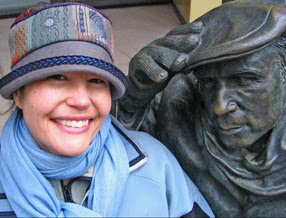 Audrey models our new Clarissa cloche below & one of our cozy hand fringed boucle knit scarves. 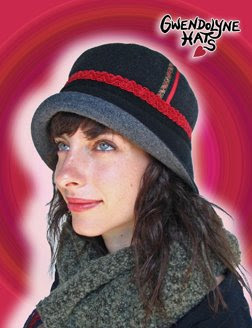 This Romantic hat, hand-cut from cashmere blend wool, is accented with specialty trims and a vintage button. Its brim can be styled up to highlight your face or down to protect you from the weather. See more hats on Audrey click here. 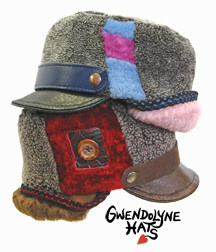 Gwendolyne hats have personality, they speak to people about warmth, style, individuality, and spirit. They are a great form for expression. A lot goes into each hat. We make all sizes, each one well designed, expertly crafted and unique. Wearing our creations is definitely a feel good experience. I make beautiful hats for beautiful people. My customers are special human beings that celebrate life. For them beauty radiates from the inside out. A confidant smile is very powerful force. It can change the way you see the world and affect how the world perceives you. 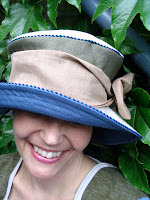 I want my customers to be happy in their hat and spread that positive energy forward. Below you will find a picture of me with my latest fiber art creation titled “Good Vibrations”, for the Textile Museum of Canada’s 12th annual Shadowbox Show and Silent Auction. This amazing show is always a highlight of the season and it just keeps getting better. I highly recommend that you go see it. I love handwork and over the years I’ve noticed a renewed interest in these traditions. I want to share some of my knowledge in this field. 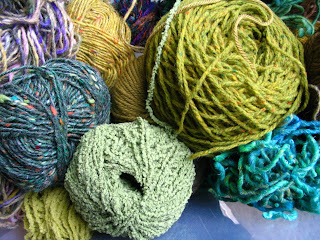 In the Spring I plan to teach a Fiber Art course in my Atelier. If you are interested please send me an e-mail. For what you will find at our Sale click here! Summer is in full bloom, school's out and the kids are frolicking. We have already experienced some wonderful moments ourselves. I do love how our city of Toronto is such a magnet for great musical talent in the summer. The best part of it?... the fun's all outside. 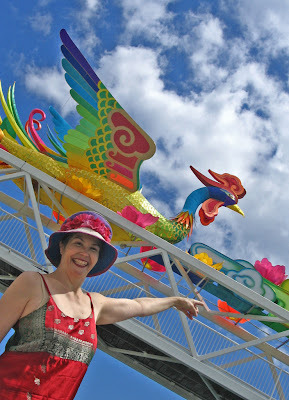 William and I have been enjoying the Harbourfront concert stage, where free music events hit center stage every weekend. Our taste in music is adventurous, so we appreciate the many different styles and cultures on the program. We've enjoyed many a moonlit serenade while dancing under the stars. It's a lot cooler down by the lake. Our most exciting concert to date featured a 10 piece Afro Soul group from New York called the Budos Band. Tremendous live energy and a great new CD too. 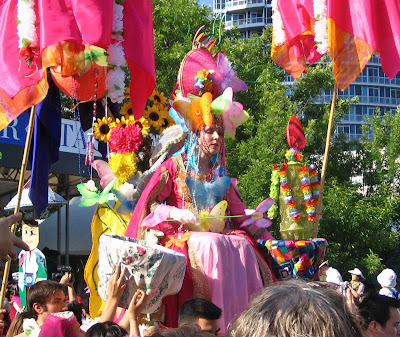 On another day we came across a colorful display of the multi- cultured creativity our city offers. It's so great that Toronto celebrates its diversity. In the end we learn more about each other and that's why we live together peacefully. What a beautiful day! My son Aaron and his wife Catalina have been living in Japan this past year. This photo illustrates the true beauty of the Japanese cherry blossom. 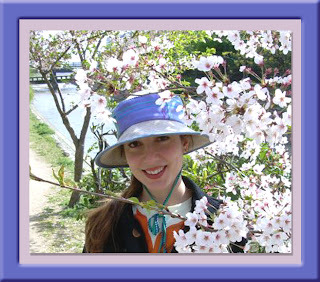 It's so nice to see a Gwendolyne Hat underneath these magnificent blooms and on the head of my wonderful daughter- in- law. It was a honour for me to be one of the judges at this year's Toronto Outdoor Art Exhibition held in the Nathans Philips Square. I was very lucky to meet some very creative artists and I enjoyed this opportunity to talk with them about their art. In the end I got to choose who I thought to be the "Best" and the "Honourable Mention" in the Fiber Media category. Fourteen years ago I was the recipient for Best in Fiber, so for me this was a full circle. I got to pass the torch on to someone else. It is great to see how many new artists have embraced this tradition. For centuries it was a cherished creative outlet amongst women. I’m so happy to watch this passion continue to grow. It may be hot outside but in the studio we are busy preparing for the cold. It takes 8 long diligent months to create my new winter collection. We had a lot of fun this past month building the 2007 edition of my Boucle Scarves. Here I am working with my talented assistant Jessica. 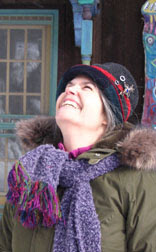 Each scarve's fringe is created from international designer yarns. 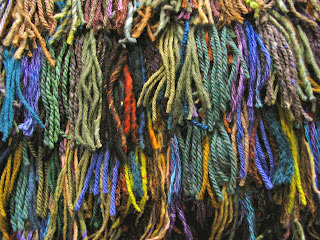 Like an artist's palette the yarns are stored different colour containers to make the colour selection more accessible. The yarns are then cut and hand laid one by one at each end and then sewn in later. Like a painting each fringe is a unique combination of colour and texture. As a child it was always the fringe that made me enjoy my winter scarfs. So I produce these not only to provide terrific winter warmth but also to offer my clients that splash of color to inspire their winter days. I realized this weekend that our intentions create the wonderful world we get to experience. All you have to do is open your mind and life will unfold. By making a simple plan, to get outside on our bikes, with a picnic in our baskets, we laid a path to the most magical day. The surprises that await you are always just around the corner. It is all about timing and whether we are ready to recognize the gift! You're only as lucky as you want to be. So lift your wings and soar like a bird, then sing out loud and spread that joy forward. Hurray it’s truly here! The big smile on my face says it all. 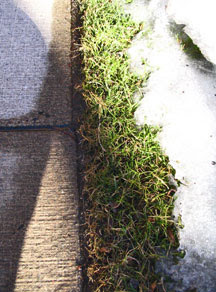 The warm weather has finally arrived and planted its feet firmly into the ground. I remember that sunny day when everyone came out of their collective caves. People were definitely under dressed, but hey, we were all happy and the smiles were infectious. Here I am modeling my new Abbey Road design downtown in one of Toronto's many graffiti alleys. With all the beautiful weather outside I've been a bit distracted, who can blame me. Fortunately the natural light streaming in the southern windows of our studio has spurred on my creativity. I've just finished a gorgeous new edition of Gwendolyne Hairbands for the shop. I love hair bands, but I always had difficulty finding the proper fit and selection was limited. So, last year I created my own. This year my customers are telling me "hair bands are in". Well I personally didn't think they were ever out, at least not for me. Perhaps it's my long hair. In the Summer, I don't like how the heat can build up at the back of my neck. A Hair band helps to keep me cool. After a swim a hair band keeps the wet hair off my face. A good hair band can be a great Summer accessory. 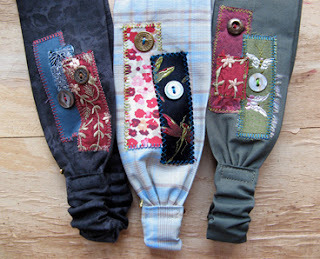 Some of my new Hair band designs have miniature vignettes of fabric appliques and antique buttons. 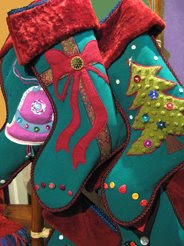 They were a lot of fun to make, and are a thrill to see on my customers. Here is Andrea, new to Toronto from the East coast. She was happy to have her Hair band choice custom sized for her on the spot. It is so nice to offer those extras to my customers when I can. We ended up talking about the acting scene in T.O. As a farewell gift, I gave Shihoko this hair band and best wishes for her journey back home. She is a lovely Japanese woman who worked in our building’s cafe this past year. My son Aaron and his wife Catalina are teaching English in Japan. 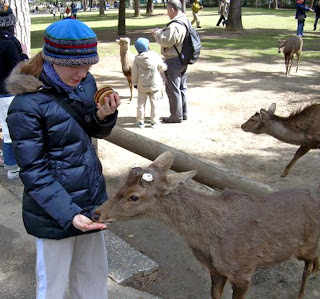 On this spring day they visit the temple at Nara and feed the deer who roam freely all year round. Notice the hat. 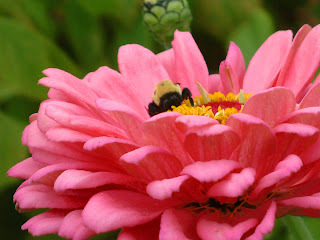 Over last several weeks there has been a real buzz about the environment here in Canada. It's great to watch this fertile seed grow in our collective conscious. Together we are a powerful force that can stand up and effect change. Wake up that sleepy giant and let's strive for a better world. Last weekend the Green Living Show was happening in T.O. It was exciting to see a show about alternate lifestyle choices become a platform where politicians and environmentalists duke it out for social change. Kudos to David Suzuki for standing up for the environment. Instead of going to the show we decided to venture out and appreciate nature first hand. We packed a picnic and off we rode to the Leslie Spit; an amazing natural resource and one of our favorite spots in the city. It was a day full of wonderful surprises. Like ourselves many people were out enjoying the Spit, on bicycle or on foot. So were all the flora and fauna. I have never experienced so many wonderful creatures on one day. It was a special gift for us, to see more. 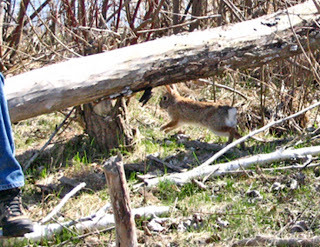 Here is a rabbit passing by William as he was resting on a timber cut down by the beavers teeth. This quick video William took of me sums up our Sunday outing the best! 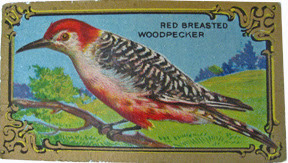 Recently an early tobacco card of a Red Breasted Woodpecker caught my eye. I was captivated by both the painters composition and use of color. I now have the complete set of 30 antique Imperial Tobacco cards (circa 1900). They celebrate illustration in ways that are reminiscent of the past. As an artist I cherish this sensitivity. As a designer I try to bring these ideas into the present. The last several weeks have been tough as I came down with a debilitating cold. It has been two years since my last cold, it also was around this time of year. 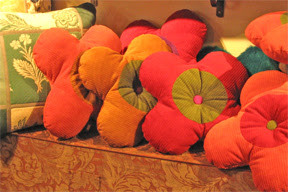 At first I didn't slow down and created a fun set of Flower power corduroy patio cushions. Then I lost my voice. For three days I was silent and drained. I had some body nurturing to do. Rest gave me a moment to regain my strength and ponder my inner self. I had extra time to observe life around me and to reflect upon some trying relationships within my own life. We all carry patterns that at times haunt us. My break from routine allowed me to examine a life long pattern of questioning my acceptance by others. Our relations with other people are built on believing people understand and love us for who we are. We are fortunate that we get to select our friends, but we do not get to choose everybody in our life. Some people are chosen for us. They are the ones that push our buttons and test our self worth. Their acceptance, or lack thereof , can create comfort or conflict within us. It is the latter that has offered me more insight lately. We are all on our own journey of self approval and we are all at different stages. To acknowledge this is to release one from the self doubt that resides from our perceived thoughts of others towards us. I believe now that the things people see in others which they have not yet attained for themselves, can create barriers for deeper relationships to grow. By acknowledging this, I can let go of my struggle and tap into my source. I will accept these relationships where they stand, without expecting the emotional change to happen. I know this will bring me a greater peace with these people in my life. Letting go can lead to a new beginning. That is one thing the Spring season offers us, a fresh start! Now what does all this have to do with HATS? 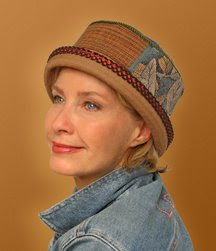 Acceptance of ones appearance is the key to enjoying the most out of life and the key to enjoying the wearing of a hat. We are unable to change our birth right of looks. Our genetics have been given to us without choice. It is only when I accept my face in the mirror am I able to celebrate it. 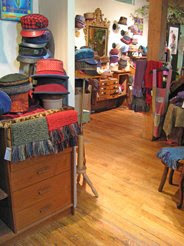 There are many people that visit our shop and say they are not Hat people. I understand deeper what that comment means. We were gifted last Thursday, to see the Stars on Ice by my brother Jeff and his family. It was an exciting evening out at the Air Canada center. Kurt Browning was a sight to behold. His ability on and off the ice reveals the exceptional talent this individual has. Every performance on the ice was breath taking. I hope one day he visits us at Gwendolyne Hats as he would look amazing in our Tibetan design. 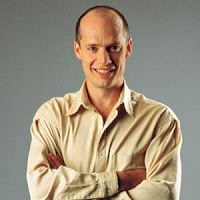 Now having seen his live performances that evening, I have officially become another a Kurt Browning fan! My cold is on its last legs and I am very grateful for the lessons this journey opened me up to. 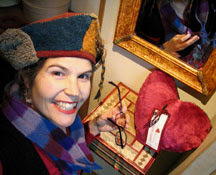 All is well, and I am once again busy creating some new hats for wonderful people. It was the eve of the Spring Equinox. When the day light equals that of the night. I took this photo of the moon just after dusk on the 20th. 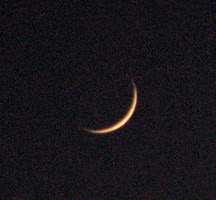 Earlier in the evening the planet Venus was also making a visual guest appearance. It is always fun for me to see. I am lucky for I have a friend who is a wealth of knowledge when it comes to astronomy and he gives me the updates about the sky from time to time. This one being a very special. Lately we've been bringing the Spring indoors with a daily bouquet of fresh cut flowers. 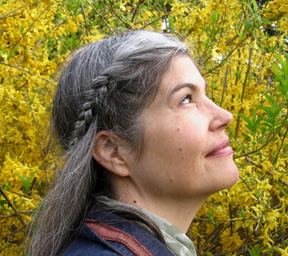 People experience an energy shift amongest flowers. Our bodies become calm and our minds open to uplifting sensations. Flower power, that's what it is all about. Perhaps that is why the Spring season is so revitalizing. My new Abbey Road design is exciting. It's the first time I've had the opportunity to showcase my antique vegetable ivory buttons (circa early 1900). 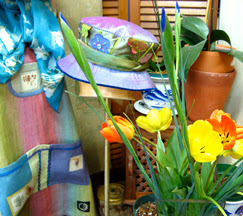 Filled with colors of a new Spring garden, this cap will surely brighten anyone's day. Made from in boucle plaid wools from France. All are lined with silk and have lamb leather peaks. The edition is limited, each one is unique. 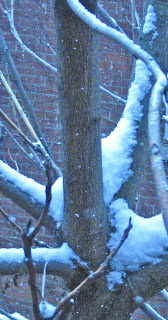 "We stand at a place, knowing there was a past, knowing there will be a future"
Our last snow storm shut our city down. It was the final blast to give our gardens a root quenching supply of water for natures' new growing season. Earlier this week I could feel the sensation of the renewal under my feet. My Parsley was turning green in our garden. The longer hours of sunlight was helping to wake all life forms. Everywhere outside you looked, there was a lift of energy and spirit. 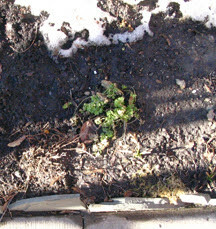 March break began on Friday and the weather was kind. By Sunday there were so many people out and about all one could do was get excited. 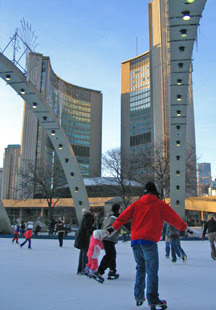 Walking by our City Hall I checked out the rink. The number of people were less then usual. This winter William and I have had a lot of fun skating. We try to go out at least twice a week. I think I have captured one of the last shots of decent skating ice for the season. Here is a slide show of one of our lasts. It was also the day we turned back the clock. 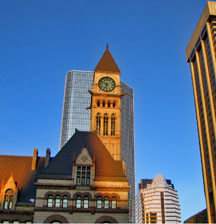 This photo here is our old City Hall. I just love how the setting sun creates such glowing golds onto the buildings surfaces. 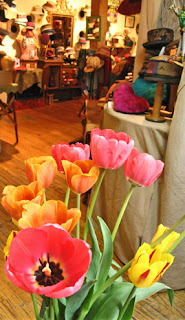 In the shop during Saturday some of our Spring and Summer was unveiled. It was so uplifting to see the new fabrics. Very soon we will all need to protect ourselves from the sun and the heat. Till then Spring is just fine for me. Time to pull out my light weight clothes from storage. Later in the evening I went out with a girlfriend to the Canada Blooms show here in Toronto. This was a first for me. We arrived when the day crowds had just left. So we could experience the show on our own terms. I also was very impressed with the environmental garden displays. To create these dioramas is a challenging task. The one that was the most exciting included a garden shed, a pond, and a cozy "S" curved walled retreat. I could visualize themself one day with something like that in our garden. I would make it my morning retreat. The website does not really represent the talent that you will see when you go. All 5 senses need to be involved, so if you are in Toronto I highly recommend going. Especially if you love to garden. I didn't bring my camera sorry no photos of the evening. I have just finished a new fab design called "The Abbey Road". It is going to be a great cap for the wearing during moderate temperatures. My customers will be getting a sneak preview first by personal email. I will post a picture of it next time I web log on. In closing, I wish you a happy Spring cleaning. I find it brings a lot of fresh new energy into my life. A yard sale seems to be shaping up with all the items I am sorting through. What fun! I think I will be contacting my girlfriends and do one together. These last winter weeks have been very challenging and exciting as I have produced a new winter hat design that will surely bring many new smiles to my customers. My best design work has always been created in the season to which the hat is best worn. Recently my new design "The Nadia" was perfected. 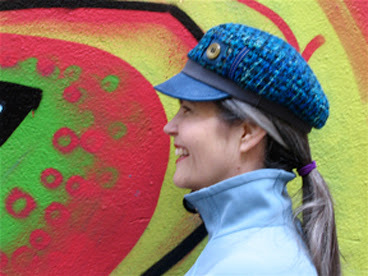 The construction of this hat requires a lot patience because I create the band design with hand sewing. Over the years I have grown to enjoy hand sewing. When I stitch I become one with time, I become grounded in the present, and do not feel the need, to hurry. My concentration is rewarded by the beauty of the furs butting up against each other. Akin to hand sewing is knitting. Twenty years ago I worked in Romi Wools, a yarn shop here in Toronto. If you ever have a chance to visit, I truly recommend you to go there one day. 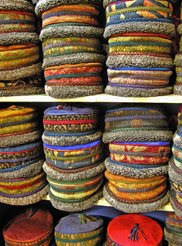 Romni Wools is a knitters paradise here in Toronto. When I worked there, it was my Moms generation that kept the craft alive. Today with the renewed interest, a whole new generation of knitting is becoming established. Knitting collectives are popping up all over our city. I am thrilled to see this movement. 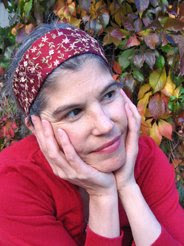 My friend Carolyn Barnett has made her passion of knitting a very big part of her life. She inspired me to begin this blog last August. 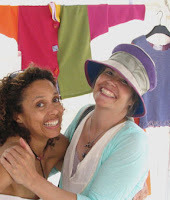 Here we are last summer at the Toronto Outdoor Art Exhibition. In life and business today the drive for quick solutions, and short cuts are celebrated and awarded by our contemporaries. There is a higher financial return for this sped up pace. I believe we carry this mentality into our lives. We validate how good the day is by how much we accomplished. Are these ideas sinking into our consciousness? Are we aware of the residual thinking patterns we create when we incorporate those thoughts into our lives on a regular basis? Is this torch being passed onto our children? In the Thesaurus some synonyms for consciousness are: sensibility, carefulness, mindfulness, recognition, and regard. These words best describe the experience I have when I hand stitch. They also describe for me a way of life that would allow our lives to be filled with great joy and gratefulness. It is a good to embrace the simple pleasures of life, to slow down, and absorb the unfolding nature our life is directing us by. Our minds will get filled with a greater positive feeling to carry us throughout the day with the recognition of our abundance. I will add that when I place myself in this awareness, I experience a greater physical, emotional and spiritual sensation throughout my body. I highly recommend the book You can heal your life by author/healer Louise L. Hays. I recieved a copy for my birthday this year from a dear friend. I read a chapter once every morning till I finished the book. Her words were so positive and insightful about our thinking patterns. The book lifted my spirits even higher and gave me new tools to use for personal growth. Like the hats I make for people, this book is a keeper to use and read many times over. Instead of passing it along, I intend to cherish this book gift and inspire others to get a copy.